It’s a great time to work on getting in shape! I can’t even tell you how much I’ve benefited from Getting Fit With Jen’s personalized training program. She’s very gifted at creating workouts that fit an individual’s needs – no matter what your physical needs, limitations, or strengths. I’ve had to work hard, but by following Jen’s programs, I really am getting more fit. I love it!! This month, Jen is offering $10 discounts on her personalized workout programs. Take advantage of this – and you will not regret it! Time to get fit and feel great! Most of the time I crave it, love it, and can’t wait to hit the pavement and/or the weight room to get in a good workout! But every once in a while, I just don’t want to do it. Not even a little bit. The very idea reminds me that I might just feel hip pain. And truly, there are days when I just don’t feel like I can add one more item to my to-do list. Working out? Is it really necessary? After all, I ran up and down the stairs four times this morning to switch out laundry. Doesn’t that count for something? This week I had one of those days. I was tired, my muscles were sore, and I was crazy busy. I had two hundred things to do (which, of course, is not an exaggeration or an overstatement at all because I would never do that in a million years). The thought of leaving my house for even a short workout just made me feel stressed out. One more thing to do? I don’t want it! I smiled (sort of). I stretched. I put on my running shoes. And we went for a short, but fast paced walk for 30 minutes. It wasn’t long. It was certainly not the hardest workout we’ve ever had. But it was a good workout nonetheless. I worked up a good sweat, got my heart rate up, and burned off some stress. But I really thought nothing of it. Once we got back, I continued with my afternoon, finishing some of Malachi’s school work with him, then running Asa up to the soccer complex so he could referee a game. It wasn’t until I was pulling out of the complex that I realized: Wow. I feel really, really good. It was amazing actually. Before the workout, I had been sore, tired, and discouraged thinking about all the work that loomed before me – wondering how I would ever get it done. The moral of this story: If you don’t feel like working out? Do it anyway. You’ll feel better, and you’ll get more done than you would have if you would have skipped the workout to do something else. Disclaimer: Obviously, you shouldn’t workout if you don’t feel like it because you are puking, have a broken bone, or are otherwise bedridden and under doctors orders to stay immobile. I think you knew that, but in the effort to cover my tracks, I felt as though I ought to say it anyway. Ever feel like you just don’t want to work out – then feel so grateful that you did afterward? I suppose it’s a little late in the season to be sharing this oh-so-inspirational fitness thought with you, and truly, it’s not like you probably haven’t already thought of it yourself. In fact you’ve likely been doing it all summer. But I’ll just share my recent experience with you anyway. Jen (from Getting Fit With Jen) and I have been walking, doing specialized resistance training circuits, and lifting weights regularly now for eight months. I absolutely love it and continue to feel so much healthier. Recently though, I’ve been getting a different form of exercise and it is so great! 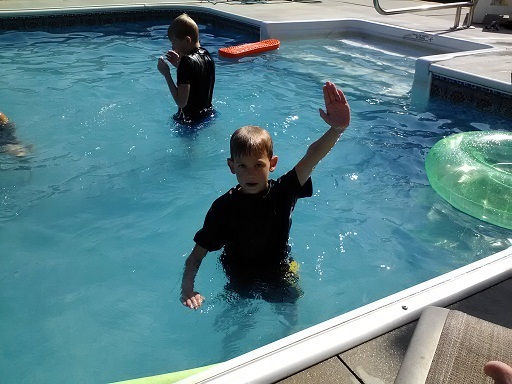 During the past three weeks, we’ve been going to our friend’s swimming pool where Jen has been giving our kids and another friend’s kids swimming lessons. (Yes, she is multi-talented.) :) It’s been awesome! 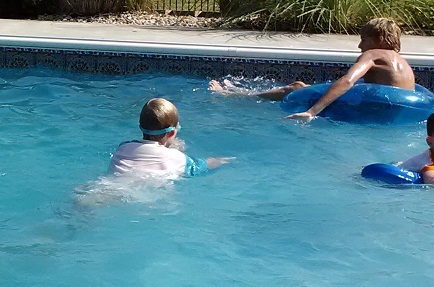 The kids have all come so far and have loved being in the water. That’s saying a lot for our younger boys. And what have I been doing while the younger kids have learned the fine art of going under water without sucking water into their lungs, and the older kids have been learning to dive? I’ve been getting a water workout! I’ve made it a point to just “keep moving” in the water for a good 30-45 minutes each time we’re there. I swim up and back and up and back in the pool over and over. I tread water. I swim up and back again. I do “standing crunches” in the water. It all feels sooooo good! Anyhoo…just wanted to encourage you, if you’re taking your kids to the pool anyway, to try to get a little exercise in while you’re there. It’s the perfect opportunity! You sure won’t be seeing pictures of me showing you how it’s done, but my boys were happy to show you some of their new skills! Looks like Asa and Justus were finished with their “lesson” for the day and were just goofing off at this point. And then there’s Elias. He’s our most timid and hesitant boy. Now he can float on his back and his tummy, and swim underwater all the way from one side to the next. So proud! Are you a swimmer? 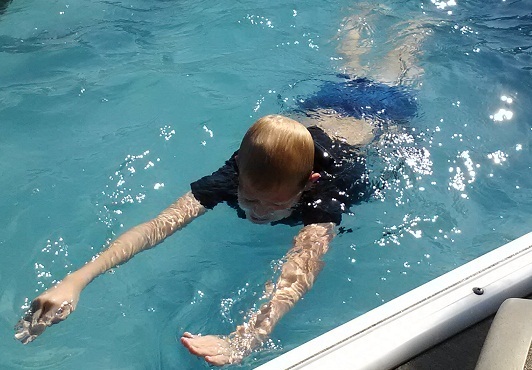 Have you found yourself getting some exercise in at the pool this summer? What’s your favorite thing to do at the pool? Fat and Calories – How Much is Too Much? 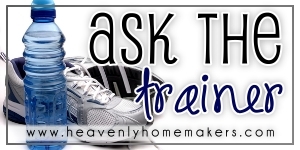 Typically I let Jen, from Getting Fit With Jen, help me out with answering questions in these posts. However, this time I wanted to speak from my own experience. Rest assured, Jen and I talk about all of this quite frequently while she’s working my tail off engaging in a long, lovely stroll with me as we work to get into shape…. I also weight train like you do, but have just began eating this way. I was on a high protein, low fat diet, but have switched to raw milk, butter, and all the other good stuff you use. Could you share with me how you balance your calorie intake with the high fat food? I feel great, but am concerned I am taking in too many calories. This is a bit of a tricky question, simply because everyone is different, and there is not a “one-size-fits-all” nutrition plan that will work for everyone. However, I will share with you what is working for me..
First of all, I have to say that I haven’t counted calories since I was a newly-wed, almost 18 years ago. This isn’t because I am one of those people who can just eat anything and not worry about weight gain. If only. I simply found the process of counting calories to be tedious and frustrating. I have since learned more about listening to my body. I now work to be intentional to only eat when I’m hungry, and then to stop eating when I’m full. This has been the most successful method I’ve found to help me maintain a healthy weight. If I get into a habit of over-eating (which would, of course, mean that I am consuming more calories than I need), or if I’m eating a lot of “empty calories”, I definitely start noticing my pants getting tighter. But if I am disciplined to eat only what my body is truly asking for, I find that counting calories is not necessary for me. As a side note, now that I’m working out regularly, I find that I definitely need more calories, but I have no idea how many. I’m simply listening to my body, eating when I’m hungry, stopping when I’m full, eating protein when I crave it, eating vegetables and fruit in larger portions as I need them, etc. 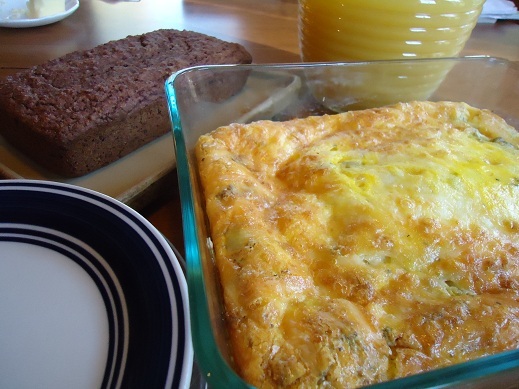 Easy Breakfast Casserole with Applesauce Bread and Fruit is a great, balanced meal. By the way, ignore the juice in this pic. We rarely drink it. We must have had company the day I took this picture! I believe that God made a lovely balance of foods -some which are naturally high fat/calorie foods (like cream) and some which are naturally low fat/calorie foods (like carrots). I believe that all of these foods, in their whole form, have nutrients in them that our bodies need. What Time of Day is Best for Working Out? Is there a time of day that is more beneficial for working out? Does working out in the morning prove to be a more effective exercise time than working out later in the day? There are a variety of studies that “prove” different theories on the subject of what time of day is best for working out. Most studies will tell you that working out in the morning is better and more effective. The thought behind this is that early morning exercise will energize you, get your day started right, and boost your metabolism. Is this true? Sure, working out in the morning can be beneficial in these ways. But what if you’re the type of person who is groggy in the morning? What if getting up extra early for exercise just doesn’t work for you? What if you simply do not have time to work out first thing in the morning? Occasionally some find that working out at night before bed makes it hard for them to sleep because of the endorphins that have been released during the workout, pumping them up and giving them extra energy. Some people find that working out at night doesn’t affect them negatively and that, in fact, they actually sleep better immediately following a good workout. I say: Exercise during a time that works best for you. If morning works for you – great. If afternoon works for you – great. If night time works best for you – great. As long as you are finding time to exercise, no matter what time of day it is, you will reap the rewards! I humbly consider myself to be thoroughly kicked in the pants. Good grief – why have I avoided exercise for so many years? Since I began to workout faithfully in January, I feel healthier and more energetic than I have EVER felt! You know one of the main reasons I avoided exercise? Okay, two of the main reasons? 1) I didn’t really need to lose much weight and 2) I have asthma. Oh dear – I was really afraid that my asthma would flare up if I exercised? Let me tell you right here and now – and this is the part where I have been kicked in the pants – exercise has made my asthma better, not worse! Beyond that, being at a healthy weight is great, but that’s a silly reason for me to think that I didn’t need to exercise. Shucks, exercise can certainly help a person lose weight (sweet! ), but as I have been working out with Jen, I have learned all kinds of reasons why exercising has been beneficial to me. I’ll let her share about those reasons here in a minute, but first I need to gab and gush about how good I feel. Here’s the deal: The past couple of weeks, my family has been passing around a cold – and I didn’t get sick. This never happens to me. Any time my kids are snotting and hacking, I catch it. Within days, infection typically hits my asthmatic lungs, causing some major issues like bronchitis or even pneumonia. This time, I began to get a sore throat, then began to fear that sickness and lung congestion would lay me flat. I upped my vitamin intake, drank plenty of water, and worked to get enough rest. And would you believe it? I fought that cold and did not get sick. And oh yes, exercise can strengthen your immune system. I realize that exercise isn’t preventing me from ever getting sick again. But I have seen so many improvements in my overall health since beginning our workouts. I’m in this for the long haul! What benefits have you seen from exercise? If you haven’t been exercising, what improvements would you like to see if you were to start an exercise program?